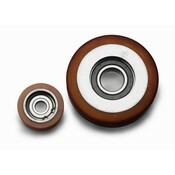 Polyurethane Guide Rollers With Shore D.
Polyurethane guide rollers with extreme hardness. Mostly used for industrial applications. Very resistant to puncturing. These guide rollers are used to control and maintain the direction in which an object is moving. Our guide rollers leave no markings and provide smooth, quiet movement thanks to the low rolling resistance of the polyurethane tread. These guide rollers are fitted with Vulkollan®, a polyurethane with an extreme hardness that ensures a high level of structural strength and resistance to puncturing. Because of their high durability and strength, these rollers are mostly used for trailers, conveyor- and transport systems, crane-operated machines, lift (elevator) systems, sorting systems and material handling trolleys.